Ask fellow campers about "Ho-Hum RV Park" and nearby attractions. Question: I will be traveling from east to west on hwy 98 towards the campground. My directions route me thru Sopchoppy and then back to 98. Is that better or just stay on 98? Answer: We were traveling west to east and just followed our GPS through Sopchoppy. 98 looks to be more scenic, though. Great place on the water (Tier A) in a very remote area with very little congestion. There is an IGA grocery in Carrabelle and great seafood everywhere. Lots of nature areas, lighthouses and state parks nearby. Highly recommended. We camped at Ho-Hum RV Park in a Motorhome. Great seafood for purchase one Carrabelle at Millender. Friendly and helpful staff, the waterfront spots are fantastic and the views out your front window are beautiful! Shoreline and pier are great. Very clean campground- no dust. Enjoyed our stay! We camped at Ho-Hum RV Park in a Motorhome. Post Hurricane Michael, this park is a survivor. Obviously the ownership put forth the proper effort to get ready for "the season". There are a few quirks you have to be aware of, one of which is the replacement electrical pedestals do not have breakers, so the office asks you to trip off the master breaker in your RV before hooking up. In our Monaco, not so simple, but no big deal. The host parked us efficiently, and carefully. This place is not kid-friendly, for good reason...there's no-where where the little ones would either not be in danger because of the rocks by the water...or the road traffic, or they would be running around a small park bored to pieces., The park is NOT kid-unfriendly, the circumstances surrounding it's location is at fault. Nicely manicured dust-free gravel, the pier is in great shape...and that water-view out of the coach window was just awesome. The value proposition was the big attraction for us, under 50 bucks and water is pretty rare. We camped at Ho-Hum RV Park in a Motorhome. breaker on the utility post. We were in a pull-in site in Tier A, right on the water so the view out the front window was simply amazing! Easy to find, friendly staff. Utilities worked well. Would probably be tight quarters if park was full. Will definitely stay again...longer than 3 days next time! 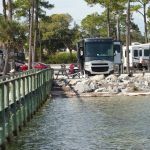 We camped at Ho-Hum RV Park in a Motorhome. Watch the birds swooping down to catch their dinner, watch the dolphins swim past, chill out! Lots of little museums and shops all along US98. If you like oysters, you will be in heaven. Great seafood restaurants. Just a great place to kick back and relax. 50 amp, FHU site directly on waterfront. Wonderful views of Dog and St. George Islands from any Tier "A" site. This is a well run, clean campground and our 3rd trip here. We will return to enjoy the view. Cable TV and WIFI included. Very friendly, helpful staff. Sites are crushed shell and sand not gravel although I checked gravel in the choice box (below) there are no selections for shell. 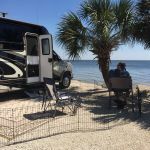 We camped at Ho-Hum RV Park in a Motorhome. Visit Eastpoint, St. George Island, Apalachicola and the WWII museum in Carrabelle, well worth your time. If you like fishing Carrabelle is your kind of place. We stayed here a year ago, and this review is pretty much the same. You can't beat the view if you get a Tier A site. If in a MH, you drive in to your spot, so you face the water & have the view out the front. We had site #35, which is an end site, so we also had views out the curbside of the coach. Site #50 is also an end site with views out the road side. This is a no frills park that is very relaxing with nothing much to do but fish & read. If you want activities, this isn't the place. 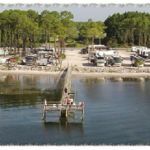 Carrabelle is small & charming with a couple of restaurants, grocery, Ace, and a marina. We had good Verizon service with ample cable channels. WiFi was good with an occasional slow down. FHU site was crushed shells and level. Sites are fairly close, but ok for us. Bring insect repellant as the no-seeums were out. Didn't have them a year ago, so I guess it just depends. No swimming beach, but can walk the shoreline at low tide with the dog. We would stay here again. We camped at Ho-Hum RV Park in a Motorhome. This is a very nice campground located right on the Gulf of Mexico. 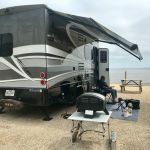 We have a 45' motorhome and had a pull through site that wasn't long enough to stay connected but that had more than adequate space for the towed vehicle. The entire campground is sand or gravel. All connections were in the right spot and everything worked. They have a fairly long pier out into the gulf that can be used for fishing or just looking. We really enjoyed our stay. 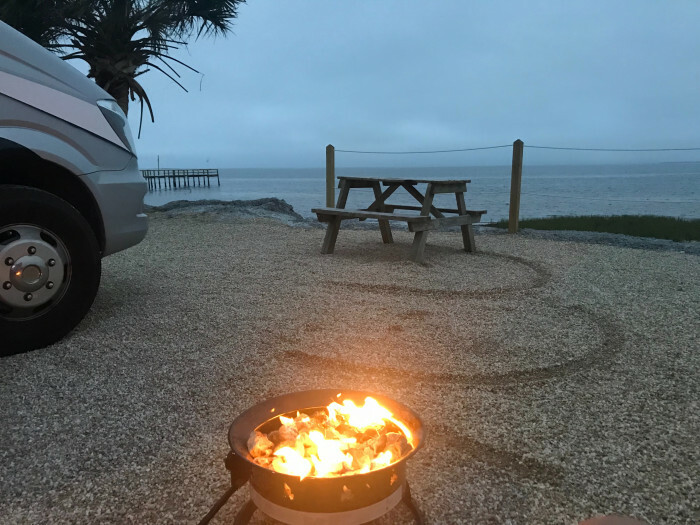 Other campgrounds in the area also have a nice view of the Gulf but are across a main road. Ho-Hum is right on the gulf. The trees blocked both satellite dish antennas. We did receive quite a few over the air signals. We camped at Ho-Hum RV Park in a Motorhome. We had the best meal at Lynn's Oysters in Eastpoint. Doesn't look like much but the food is so so good. Beautiful waterfront sites. They were small but that is to be expected. Views are great and good place for fishing off the dock or kayaking off of the small beaches which make great launches. Close to Carrabelle if you need a grocery store and restaurants. We will return. We camped at Ho-Hum RV Park in a Motorhome. We arrived at Ho Hum at the end of October 2017 and stayed thru March 2018. The park has no grassy areas for rv parking or patios, but when you pull in the first thing you notice is how clean the park appears. The entire park is raked daily (except for rainy days) and looks fresh and immaculate. The pine cones are also picked up daily or more as needed. And for it to be all gravel (crushed oyster shell), it is not dusty at all. The hosts are friendly and helpful. They are RVers too. They are always willing to assist in any way they can and really go above and beyond to help out. The park has wifi and cable. The wifi was in a transitional state while we were there. They had excellent wifi when we first arrived and then they transitioned into another which was not "so excellent" before we left. I understood they were in the process of returning to their original wifi in the near future. The cable was state of the art, second generation digital cable. Not "been in the park forever" kind of cable! As with all RV parks that I have been familiar with, the cable is provided to the site at the pedestal and you provide the cable into your rv and/or tv. If you have an issue with the cable, someone will come out to your site and check the signal at the pedestal for service, it's up to you to get the signal into your unit. And it doesn't matter if you had cable service at your last rv park, if it wasn't second gen digital cable there, you may not have the right coaxial or tv to process the signal here. Listen up, it is not Ho Hum's fault if your unit/tv is not compatible with second gen digital cable! Ho Hum is the only RV park in that area that is actually on the water side of the highway. It has a natural beach, not a man-made one. If you are looking for a pristine beach, travel on to the touristy areas of Florida and leave Ho Hum to its natural, peaceful beauty. We camped at Ho-Hum RV Park in a Fifth Wheel. Ho Hum is a little remote. Four miles to Carrabelle, fourteen to Eastpoint and twenty-four to Apalachicola. St. George Island at Eastpoint is the closest "beautiful" beach, in my opinion. Lots to see on SGI! Apalachicola is a lovely little town and a must-see. Quaint shops and lots of places to eat. Many state parks and sights within driving distance of Ho Hum for awesome short day trips. Stayed a week on a water front site. Cable and Wi Fi were very good. Great staff and one of the cleanest parks we have ever stayed at. Love this place. We camped at Ho-Hum RV Park in a Motorhome. This place is a hidden gem. We stayed here for a month and although it has no amenities, it was the best campground we ever stayed at. Their tagline "It's just another ho hum day in paradise" is spot on. We really enjoyed ourselves meeting our neighbors and the view of the gulf is just incredible. Only downside, which is not the fault of the campground, is the lack of any good grocery stores in the area. But hey, I'll take a weekly trip to Crawfordville (30+ miles) to be able to enjoy myself at a great place like Ho Hum. We definitely plan on returning and spending a longer time here. We camped at Ho-Hum RV Park in a Motorhome. Go to Emsy's for a good breakfast. other good restaurants close by are The Pearl, and the Fishermen's Wife. The Bottle House, and Polic station (telephone booth) are must see places in Carrabelle. Also, take a drive over to St George Island for great beaches and the state park. Super clean, fishing dock, great location to visit the Forgotten Coast. Our site was a large pull in site directly overlooking the water. Most sites are pull through with plenty of room. 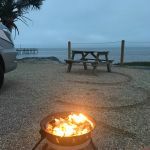 We camped at Ho-Hum RV Park in a Motorhome. Great location to visit the Forgotten Coast. Several good bike trails in the area. Great kayaking access in the campground. Family Coastal Restaurant in Eastpoint was great, Two Brothers in Carrabelle was good too. Visit the Worlds Smallest Police Station in Carrabelle. We stayed here a week while passing through the area and we were in a pull through site near Hwy 98. Everyone was friendly and fishing from the pier was a lot of fun. Hwy 98 noise at night is annoying, ran the fan in the bedroom to help out. Cable tv was good and utilities worked well. Verizon service was good. We would stay here again. We camped at Ho-Hum RV Park in a Travel Trailer. Nice park. The staff was very nice and helpful. Clean restrooms and showers. Sunny and open sites with gravel surface and a picnic table. We spent 7 nights here and will be coming back. 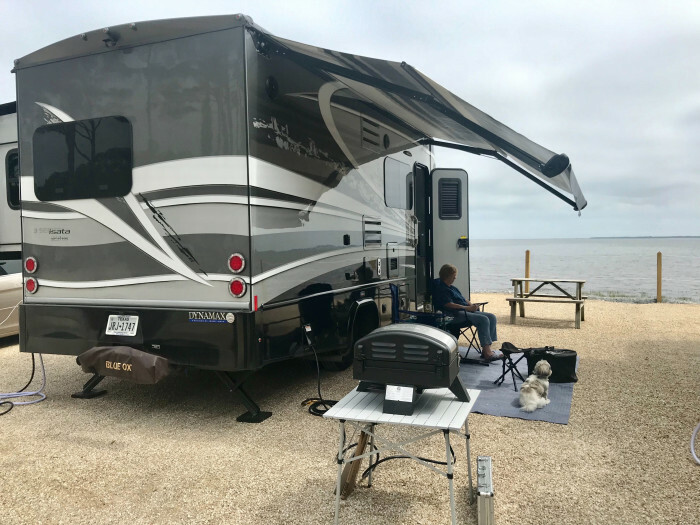 We camped at Ho-Hum RV Park in a Fifth Wheel. The state park on St George Island which is near by, is a must see. 50 amp, FHU waterfront site directly on the Gulf of Mexico. Excellent view. Well maintained, well run park. Our second visit and we will definitely return. Staff very helpful and friendly. We camped at Ho-Hum RV Park in a Motorhome. If you like to fish this would be a good place to do it. Carrabelle is a very small, old time fishing village with only 1 grocery store and 2 hardware stores. Apalachicola is about 25 miles west and quite a bit more touristy. Be sure and visit the WWII museum in Carrabelle, you would be very surprised at what went on here during the war and how much this little town contributed to the war effort. We stayed 10 days and had plenty of thing to see and do between the nearby beaches, restaurants, museums and fresh local seafood. We enjoyed our stay and would highly recommend. Small town of Carrabelle is mostly a fishing town with a few stores and a small grocery store. Larger towns are about 35 miles away. There is nothing to do here except relax unless you love to fish. So much to do in area but if you love oysters go tp Lynn's in Eastpoint. small town with small IGA store. Good fish market in town. Park sits on the edge of a National forest so lots of nature things to see. Also Dolphins, Pelicans, beach walk. True relaxation. There is not much else to do in Carrabelle. No one under 17 allowed. St. George Island is definitely worthwhile. Park is 4 miles east of Carrabelle and about 25 from Apalachicola and the views driving along HWY98 to either are very nice and worth the drive. Most towns in this area area fishing towns. Be sure and visit the Carrabelle police station (it's a phone booth) and read up on it's history. There is a very nice WWII museum in town which explains how much went on here during the war. Dog Island (viewed from the park) was used to practice landings for the invasion of Normandy......don't miss it. There are many parks and small towns within 50 miles to catch the flavor of this area on the forgotten coast. Tallahassee is 40 miles away for major shopping. Oysters in Apalachola were wonderful. No real shopping in Carrabelle. Grocery store but prices are hefty. WalMart 35 miles. Apalachacola and Port St. Joe are nice communities. Up A Creek Restaurant is good in Apalachacola. We ate at Fisherman's Wife in Carrabelle and it was good. Apalachicola is a short 20 minute drive on a nice scenic Hwy 98. Unique shops, good food(The Owl),and a local Brewery (Oyster City). Grocery just down the road. The Blue Parrot on St George Island great place for Gulf front lunch!! Carrabelle is a cute little fishing community with several good restaurants, IGA grocery store & Dollar General. Worth driving to Apalachicola to spend an afternoon. Highlight of week was lunch at Owl Cafe in Apalachicola. Good quality beef at IGA. The town of Carrabelle is quaint but other than a couple of small museums. really doesn't have much going on. Applachacola down the road is very interesting and St Georges Island has some beautiful beaches. A trip to Apalachicola is well worth it. We also visited St. George Island. Carrabelle... enough said. If you have never been...GO. If you have you can't wait to get back. Visit the martime museum and eat oysters at Papa Joe's in Apalachicola. Millender's Seafood Market in Carabelle for FRESH fish, shrimp oysters. We enjoyed the WW II Museum. It was more than I had hoped for. We also took time to look over the Glass House and Glass Lighthouse in town. We found shopping to be more difficult. Make sure you stock up before camping. There are some excellent eating places between Carrabelle and Eastpoint. Ex: Farmer's Daughter; Red Parrot, Family Coastal Restaurant. The camp Gordon Johnston museum is better than it looks like it would be from online info. Eat at the Fishermans Wife Restaurant! We went to Apalachicola one day. Had a good time there. Carrabelle is a sleepy little town. Not much to do but a great place to relax. Just the beauty of the sea and small fishing towns on the forgotten coast. Excellent oyster bars with fantastic seafood. Lots to do in the area, Apalachicola area has lots of "Old Florida" history. The seafood is fantastic and plentiful. Check out the Gulf Specimen Marine Laboratory in Panacea, FL, just down the road from the RV park. The last weekend in April Carrabelle has a Water Festival with lots of booths, food and band entertainment. Their is an IGA grocery store in town. There is a fishing pier. Unique shopping in Apalachicola. This isn't a great beach for walking long distances. There are lots of private docks to climb over/under and no expansive white sand. Much more marshy and rustic than in other beaches along the coast. The Catholic church is only about 3 miles away in Lanark Village. The park is about 22 miles east of Appalachicola and St. George Island. The beachside lots have an unobstructed view of the Gulf and Dog Island. Since the campground is pretty small, there isn't a lot of space to walk the dogs. The beach is a nice spot, but there is also a neighborhood across the street. The streets are wide and quiet and a good place to take dogs. Site #42 is right next to the pier so we had a fair number of people cutting through our campsite to get to the pier. Are you affiliated with Ho-Hum RV Park ?